Gently cleanses face and body, leaving the skin feeling clean, smooth and refreshed. This oil-free makeup remover gently & effectively removes makeup. Gentle enough for eye area; leaves no residue. Apply with latex sponge or cotton pad, rinse with water if desired. Hydra Cleanse is also an excellent brush cleaner for water-based makeup! This makeup remover formula is lighter, yet effective on all types of creme makeup. 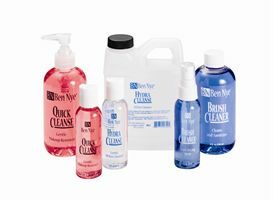 Gently massage cleanser into makeup, wipe away, then rinse off with water.